In a previous post I covered a technique to improve the performance of UTL_FILE, but concluded the post with a teaser: “you probably don’t need to use UTL_FILE ever again”. Time for me to back that statement up with some concrete evidence. UTL_FILE can read and write files. This blog post will cover the writing functionality of UTL_FILE and why I think you probably don’t need UTL_FILE for this. I’ll come back to UTL_FILE to read files in a future post. the file is to be written by the database server to a location on the database server itself, or to a location that is accessible to the database server. This is where UTL_FILE has been used, the main motivations being that it can be part of existing database-resident PL/SQL code, and does not require clients to have direct SQL or OS level access to the database server. But in recent versions of the database, you can do exactly this! The database scheduler has been enhanced to be able to to run SQL*Plus style scripts directly out of the database without needing to give OS access to database server, or the SQL*Plus executable. In the previous post I unloaded 40million rows to a file in CSV format and the responsibility for formatting the data into CSV format fell to me – I had to do all of the “heavy lifting”. Using the scheduler and the SQL_SCRIPT job type, it is as simple as writing a SQL*Plus script, and submitting it as a job. You will want to ensure that you have some controls over the usage of this feature, and what credentials the scripts will run under. Also in my example, I’ve got a connection wallet setup so that I do not have to code any passwords into the connection string for my scheduler job. But suddenly it has become easy to get access to the scripting tools we are used to on our own client machines, and utilize them on the database server. “Slow down there cowboy…” I hear you exclaim. “…That might be fine for simple SELECT * scripts, but my UTL_FILE procedures have a lot of complex logic to construct the file data”. then we change none of the logic – we only need replace all of that messy UTL_FILE code with a simple pipe command to allow querying that function as if it was source of rows, and then spool it to a file in the usual way. So next time you’re cranking out some cumbersome UTL_FILE code to write a file, take a moment to see if the scheduler can look after some of the work for you. I’ll talk about (not) using UTL_FILE to read files in a future post. I understand some people will be doing large transfers for ETL type processes, and web services aren’t the best for that, but if I think back to most of the companies I’ve worked for and most of the file-based interactions were probably better served by something other than a file load. Well, some sites need to interface data between non-RDBMS storage and databases. It’s a lot easier to just dump/read a data file on a utl_file directory that is then shared/sent/received by other specialist tools under closed security protocols that are not necessarily Oracle-specific. automate the generation of sql query output to csv. What is your suggested way to write a CLOB/BLOB to disk (on the server) without UTL_FILE? And what about BLOBs then? Totally agree with Morten. UTL_FILE is alive because it has use cases which Connor didn’t mention. And storing binary files like images, videos and so on outside of the database is one of the most popular. I mean, you could store them as BLOBs in your database, but why? It increases the size of the databases dramatically, hence increases time of creation and checking the backups, size of the backups themselves and so on. And if we remember about XE (which is very limited by size), then UTL_FILE gets even more usability. Actually, to my mind Connor just mention ‘dead approaches’, or, at least, outdated, to load and unload flat data in the files on the server. 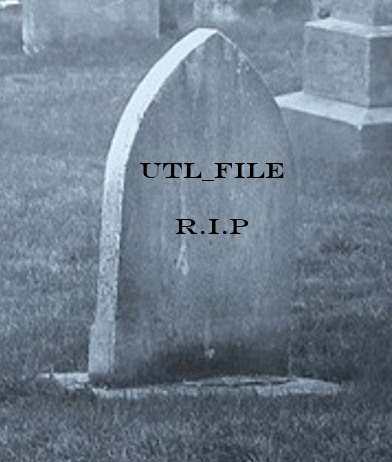 In that, I agree, but do not agree UTL_FILE is dead. I also totally agree with Morten about naming conventions in DBMS_LOB. Seriously, LOADCLOBFROMFILE and LOADBLOBFROMFILE versus CLOB2FILE? Looks like the guy who implemented CLOB2FILE didn’t even look what subprograms are there already in the package. And yes, where’s the BLOB writing function after all? Like Tim, you could say “web service all the things”, but I think not having a complete set of file manipulation methods “natively” in PL/SQL is a weakness compared to most other programming languages (and something that should be really easy to fix by Oracle). We are here, critisizing PL/SQL, because we care. Because we already convinced it is a great tool. But we are not the only ones who face this annoying stuff from time to time. There is NO chance to stay at UTL_FILE as it is DESUPPORTED starting with database Version 18c!!! even in the last versions. but for some reason, this web page seems not to be available by now. I definitely agree with all of you that an “open” API should be added to UTL_FILE for this purpose. But I don’t see one. Can you please let me know how can I replace the UTL_FILE operation with schedulers? Is your method running script on c\ drive from your local machine or on the dB server? The file is written on the database server, so it is the same behaviour as UTL_FILE. ,DB View and fields formatting – just few lines. No coding is needed. This is much more flexible and easy. Looks more like a human task and not some trivial rudimentary effort.